Tuesday August 7th 1883 I did the washing this morning and Hatt was over with both the children to spend they day they were very troublesome I mended a lot of stockings in the afternoon. I played on the piano in the evening. I had a letter from Will. 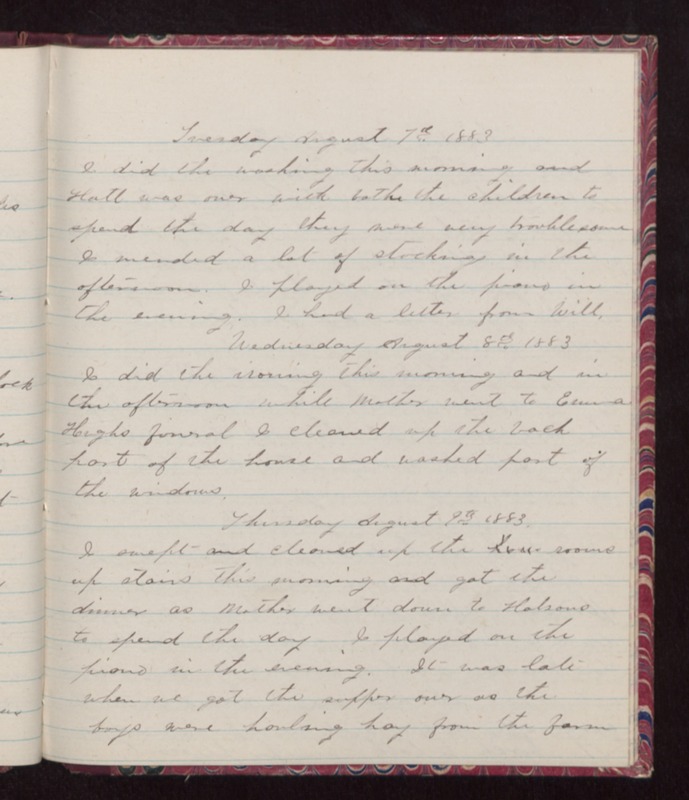 Wednesday August 8th 1883 I did the ironing this morning and in the afternoon while Mother went to Emma Hughs funeral I cleaned up the back part of the house and washed part of the windows. Thursday August 9th 1883 I swept and cleaned up the rooms up stairs this morning and got the dinner as Mother went down to Holsoms to spend the day I played on the piano in the evening. It was late when we got the supper over as the boys were hauling hay from the farm.